Intelligent racing makes the No.23 Motul Autech GT-R victorious in a bad-weather race as many teams suffer spin-outs and other trouble! The Fuji GT 400km race, Round 2 of the 2011 Autobacs Super GT series, took place on May 1st, 2011 at Fuji Speedway in Shizuoka Pref. 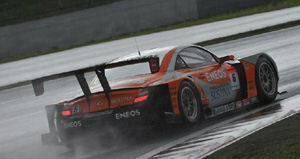 After the postponement of the first race in Okayama, the Fuji GT 400km was in fact the first race of the 2011 season. The GT500 class winner was the No.23 Motul Autech GT-R driven by Satoshi Motoyama and Benoit Treluyer. The race started at 2 p.m. in pouring rain. 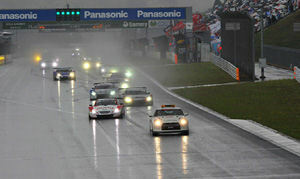 The safety car led for the first five laps, with the race starting effectively from the sixth lap. On the first corner of that lap the second-position starter, the No.46 S Road MOLA GT-R driven by Ronnie Quintarelli, ran off the track. Meanwhile, the pole-sitting No.39 Denso SARD SC430 of Hiroaki Ishiura began to lose ground steadily and fall back in the pack. In both cases, the tires chosen by the two leading teams for the start did not fit the track conditions, forcing them to make early tire changes. Also, the No.100 Raybrig HSV-010 of Takuya Izawa and No.32 Epson HSV-010 of Ryo Michigami returned to the pit early to change tires. These events put the No.24 Advan KONDO GT-R driven by Bjorn Wirdheim in the lead initially, with the No.12 Calsonic IMPUL GT-R of Joao Paulo Lima de Oliveira and the No.23 Motul Autech GT-R of Benoit Treluyer in hot pursuit not far behind. On the twelfth lap, De Oliveira in car No.12 and Treluyer in No.23 passed Wirdheim's No.24 in quick succession. After that, the No.24 Advan KONDO GT-R was also passed by the No.6 ENEOS Sustina SC430 driven by Kazuya Oshima. The ensuing Nissan GT-R battle between the No.12 Calsonic IMPUL GT-R of De Oliveira and the No.23 Motul Autech GT-R driven by Treluyer continued at the front at an exciting pace until lap 18, when De Oliveira in car No.12 lost control while trying to pass a back-marker and collided with it. The damage to the left rear of his machine from this collision forced De Oliveira to return to the pit for repairs. This left the No.23 Nissan GT-R of Treluyer, the No.6 ENEOS Sustina SC430 of Oshima and the fast-rising 11th-place starter, the No.38 ZENT CERUMO SC430 driven by Yuji Tachikawa, running as the top three in that order. Behind them, the No.19 WedsSport Advan SC430 of Tatsuya Kataoka was also giving chase. This was the GT500 debut race for the new No.19 WedsSport team and their choice of tires had fit the conditions perfectly and enabled Kataoka to move up rapidly through the pack from 14th position on the starting grid. Among these leading teams, the No.6 Lexus SC430 of Oshima returned to the pit on lap 42 to change drivers to Daisuke Ito. The No.23 Motul Autech GT-R of Treluyer, No.38 ZENT CERUMO SC430 of Tachikawa and No.19 WedsSport Advan SC430 of Kataoka all made their routine pit stops on lap 44.